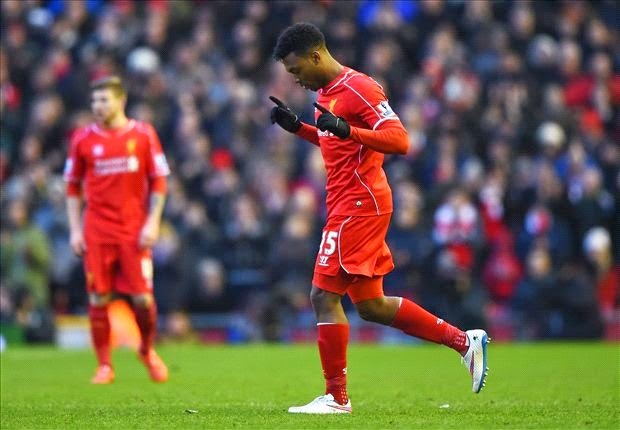 Thegoalmac has learned that Brendan Rodgers is so excited with Daniel Sturridge's return from injury after scoring during Liverpool's 2-0 win over West Ham. The striker had been out of action since August after suffering a string of injuries and fitness setbacks, but netted his team's second goal within 12 minutes of coming on as a second-half substitute. The win was Liverpool's third on the trot as they moved up to seventh in the Premier League table, and Rodgers hopes Sturridge's form will coincide with his team's continued revival. "He lights up this team. He provides the light," he told reporters. "When you add a top-class player like him to it, you can go to another level. When he came on, the team looked very, very good. He's still a bit of time off starting and it's just about bedding him back in. "But to know that he's there over the next few weeks when it will be about regaining his football fitness." Sturridge scored 21 goals in 29 appearances last season as Liverpool finished second and vice-captain Jordan Henderson is confident the return of their key attacker will serve as a boost to the whole squad. "We do feel more of a threat because he is a huge player, Daniel, He has so much talent and he can change a game in just a few seconds really," said Henderson. "It's a great boost for everyone at the club – the fans, the players. We have had our intensity back, the pressing, but if there has been a negative, it's just that we needed to be more clinical in front of goal. "But when you get such a big player back, it lifts everyone, because you know the quality of his finish."